We are thrilled to have been working with Air Football since June 2013, when we funded a Level 1 FA Coaching qualification for a group of 18 men and women in East London with some fantastic results. The course provides learners with an introduction to the practice of safe, ethical and effective management and coaching of football to young people, introducing practical drills to develop players’ technical skills such as shooting, turning with the ball and heading. It offers an opportunity for aspiring football coaches to be supported in developing their knowledge of how to effectively coach a local club or school team. Air Football engages and supports some of the most hard to reach men & women in London/Essex through their sports programmes. They recognise and understand the difficulties that many individuals face in accessing employment and indeed often in knowing exactly what opportunities are available to them. Air Football chose the 18 individuals who will take part in the course we are funding which took place in Goresbrook (between Newham & Dagenham). Many of those chosen had expressed desires to set up Community Teams and programmes to support others to participate in sport and lead healthier lifestyles. As well as gaining the qualification itself, Air Football has continued to support the individuals, encouraging them to volunteer to gain more experience and guiding them in the direction of employment. With this input, the course sponsored by the Patrick Evans Foundation has seen fantastic results. 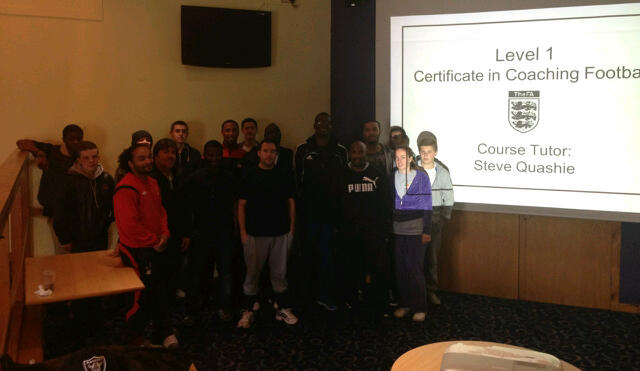 A number of participants have gone on to achieve the next level of qualifications - FA Level 2 coaching, with others pursuing Further Education at local colleges, setting up their own football training programmes, and volunteering as community coaches themselves with Air. In light of these great results the Foundation is pleased to announce that it is continuing to support Air's programme, working specifically with individuals on the verge of leaving prison and those one anti-social behaviour programmes.